How do you know when you have too much of a good thing? I guess I'll find out eventually. After my previous success with corn/quinoa pasta, I went directly to the source (Ancient Harvest) to see what else they had to offer. Wow...an embarrassment of riches. Not only elbow macaroni, which was the only shape that I saw at Whole Foods, but they also offered spaghetti, linguine, shells, and rotelle. Who knew? 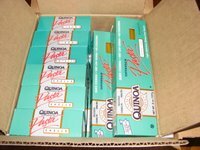 They also kindly offered wholesale prices if you bought a case. So naturally, I did. Not only do I get more variety this way, I'm sure I'm saving a few bucks that would ordinarily go to "Whole Paycheck". And the lady in customer service, Linda, was nice enough to offer that I could come to Gardena and pick up the package next time to save a few more bucks. How nice is that? Here is my first spaghetti adventure. 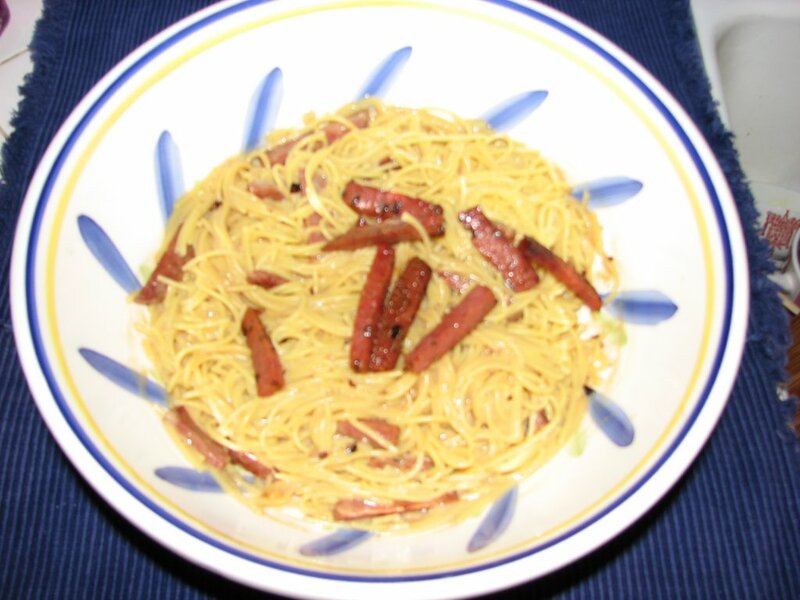 A version of Spaghetti Carbonara (usually made with eggs, cheese and bacon). The KF version (courtesy of ali patts on Chowhound) is made with my fake bechamel, eggs and crispy fried salami! I never thought to fry salami, but it was good. It was Fra'mani handmade salami which was fairly fatty, so when it rendered of course it went right back into the pasta. The salami had a good amount of garlic in it which kept me up all night, so next time I'll try to find a salami with less garlic. Verdict: pretty yummy, but the spaghetti was definitely mushier than the elbows. Note to self: the thinner non-wheat pastas can't be timed the same as the other shapes...not so sturdy or forgiving. 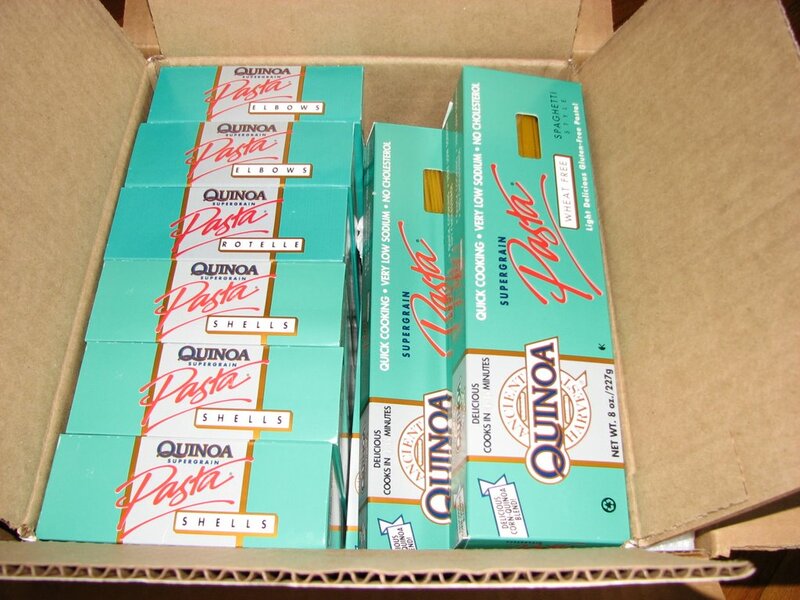 Keep an eye out for the continuing adventure of "The Food Allergy Queen eats pasta" or, "Endless Pasta-bilities." Ar ar. "How will our heroine make pasta without tomatoes? Or cheese? Or garlic?" "Can she even do it?" Tune in next time to find out!